Two supposedly intelligent, perceptive marine mammals. GALVESTON, TX—A study conducted by marine biologists at Texas A&M University has found that bottlenose dolphins, long thought to be among the most intelligent members of the animal kingdom, are "utterly incapable" of pointing out the flaws of celebrities and knocking them down a peg or two. According to a paper published last week in the journal Science, when presented with photos of music, TV, and film personalities, dolphins failed on every occasion to mock the well-known public figures, missing countless opportunities to take mean-spirited potshots at their hair, past romantic partners, or breast implants. "Frankly, this is shocking," said Professor Michael Hodges, lead author of the study. 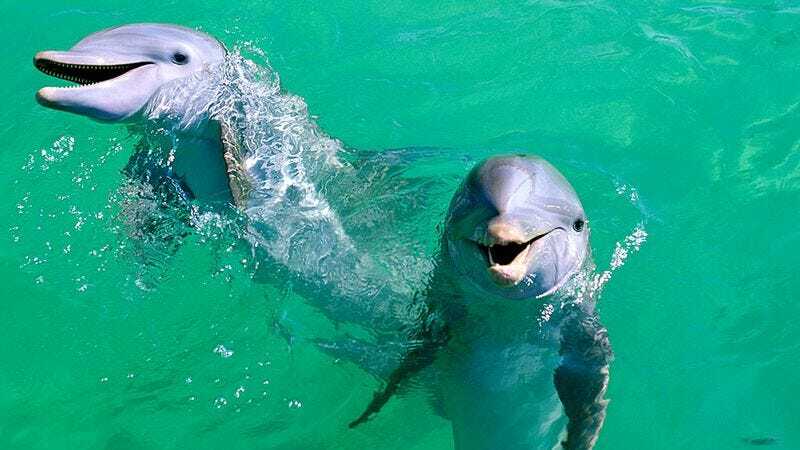 "Given their impressive brain-to-body ratio, we believed dolphins would be capable of trashing Lady Gaga, or at the very least, succeed in rolling their eyes at Kendra Wilkinson's post-baby weight gain. Instead, all we observed were blank, snarkless stares." "Apparently these creatures aren't as highly evolved as we had thought," he added. Test subjects confounded researchers by acting as if they didn't even know who Miley Cyrus is. Though analysis of MRI scans indicates dolphins possess self-awareness and the ability to form abstract thoughts, the study found the animals completely unable to comment ironically after being shown candid photographs of Hollywood power couples in their running gear. Even when presented with softballs like production stills from The Proposal, the marine animals exhibited no discernable reaction. "In one trial, Tursiops truncatus specimens were shown pictures of Renée Zellweger in two dresses, one stunning and one hideous," said neurobiologist Anne Gross, who helped conduct the experiment. "Not only did a disappointing 88 percent fail to respond in any way, but 100 percent completely missed the chance to call her a squirrel-face or ask whether the things dangling from her ears were supposed to be jewelry or some sort of fucked-up preschool art project." "And for an animal that prowls the world's warm, shallow coastlines, we found the bottlenose to be surprisingly ignorant about which beach bods were fab or flab," Gross continued. Dolphins also fared poorly on assessments of emotional aptitude, scoring lower than chimpanzees on the In Touch quotient test, which measures an animal's ability to cruelly mock Kate Gosselin's performance on Dancing With The Stars in a sad attempt to feel better about one's own boring life. The A&M team had hoped to build on recent breakthroughs in the field of cetacean celebrity ridicule, most notably a 2004 Japanese study in which scientists claimed to observe a sarcastic resemblance between the prolonged moans of a humpback whale and the muscular baritone featured on Michael McDonald's recording of "Ain't No Mountain High Enough." "The literature suggested a potential for snide mimicry in aquatic mammals, so when one of our dolphins downed 40 pounds of fish in a single feeding, we thought it could very well be some kind of Kirstie Alley impersonation," said Gross, pausing for several minutes as she pulled up data from her laptop. "Furthermore, oh my God, look at this: TMZ is reporting that Jessica Simpson is addicted to nicotine gum. What a fat bimbo." The researchers suffered their greatest setback when a young female bottlenose, who on multiple occasions had refused to simulate vomiting when exposed to multiple Rob Schneider films, chose to isolate herself at the far end of the tank and pass her time solving logic puzzles. Regardless of these difficulties, Professor Hodges vowed to carry on with his research. "We know that dolphins use complex communication systems and possess a large neocortex more intricate than our own," Hodges said. "It's entirely possible they've developed petty new forms of below-the-belt star- bashing we haven't even conceived of yet." Added Hodges, "That's what keeps me going." At press time, Hodges remained unaware of the dolphins' ongoing discussions of how socially constructed concepts of celebrity distort public discourse and undermine cultural progress, because he lacks the ability to communicate telepathically.